Now this would be something to include in the Thanksgiving Day blessing. It seems last year, NBC considered making a two-hour holiday-themed Parenthood TV show reunion movie. No word if creator Jason Katims would have been involved. Reportedly, it could still happen in the future. 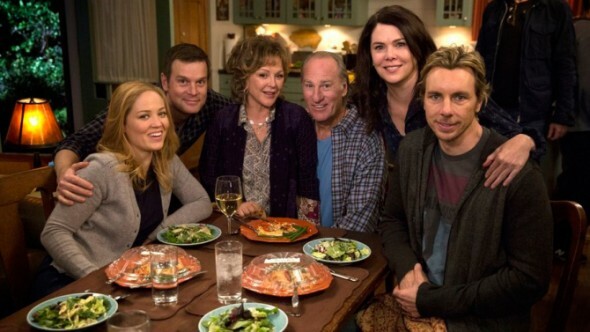 The Parenthood TV series cast includes: Peter Krause, Lauren Graham, Dax Shepard, Monica Potter, Erika Christensen, Sam Jaeger, Savannah Paige Rae, Max Burkholder, Joy Bryant, Miles Heizer, Mae Whitman, Bonnie Bedelia, Craig T. Nelson, Tyree Brown, Sarah Ramos, Xolo Maridueña, and Ray Romano. TV Line‘s Michael Ausiello says, “For a myriad of reasons it failed to materialize, but my gut tells me the Peacock will make another run at it in the next year.” SPOILER WARNING: the TV Line link leads to Ausiello’s column, which spoils shows currently on air. What do you think? Are you a fan of the Parenthood TV series? If NBC makes a Parenthood reunion movie, will you watch? More about: Parenthood (2010), Parenthood (2010): canceled or renewed? Parenthood: What Happened? Has the NBC TV Show Been Cancelled? Parenthood: NBC Wants a Second Series Based on the Movie — Will This One Work? YES, please. That was my very favorite show. I looked forward to it every week. Loved all the characters and especially loved the story line. Please do reunion also would like to see it came back.I just finished watching it on Netflix and loved the show it was good. I will definitely watch the reunion show. Parenthood was one of the best family dramas I’ve seen in a long time. It touched on real life family situations in a tasteful manner that made me feel for every character. I was not only sad that a major character died but also that the show ended. I am hungry for more because today’s television offerings are mediocre and redundant for story lines. We need more shows like Parenthood. Yes!! Absolutely do a reunion show or even better continue the series!!! Bring Zeek back too! Would be thrilled to watch a 2 hour holiday reunion show of Parenthood. Great show. Would certainly watch anything they put out to follow up with the family members. YES – Please do a reunion. I miss this show terribly. I don’t understand why it was cancelled in the first place.